A look at my recording booth. My home studio, now dubbed “Studio Blue” after my kitten–Baby Blue Bear Von Meow (it’s complicated)–is coming together nicely. Thanks to the generosity of my General Manager, Operations Manager, Chief Engineer, my voice over friends, my family, and my super patient and understanding wife, I have borrowed, scrounged, picked, and purchased the equipment I need to record at home. Rocking a Marshall MXL V67G large condenser mic (which has this great tube-like warmth) through a Focusrite Scarlett 2i2, and finally into my DAW Adobe Audition, I am incredibly happy with the audio quality. 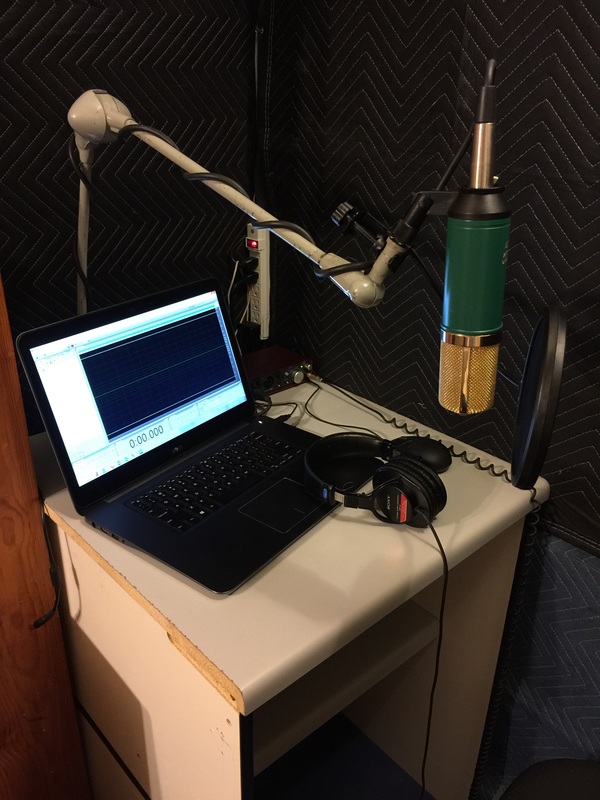 I’ve had a few gigs so far, and I’ve just finished recording an audiobook for author Chrissy Moss, but I’m just getting started. I am the voice for your project. Contact me and let’s get to work.